Cooking is no easy task, especially if you’re someone who doesn’t know how to cook very well or if you’re someone with a family to feed. Any utensil or gadget that pledges to make your time in the kitchen run by more smoothly probably sounds like music to your ears. Sadly, kitchen innovation has practically come to a halt in recent years. This is especially evident if you watch television with any frequency. Infomercials have put amazing kitchen gadgets in front of the eyes of consumers! However, these next ten might just leave you scratching your head. The logistics of this utensil pose a problem immediately. The real estate required in your precious kitchen drawer space doesn’t seem worth it because these scissors are awkwardly shaped and can’t lay exactly flat in either direction. Also, if you’re someone who is against using a perfectly viable pizza cutter, your kitchen shears could do the exact same thing, and they wouldn’t cost you a whopping $22.99 plus shipping and handling. Canned tuna that is too watery or oily, depending on how you buy it, is typically the last thing anyone would want to eat. There are very few things that are of worse taste or texture. All things considered, this is a pretty smart product that is compact for simple storage. Amazon lauds this ‘thoughtfully innovative design’ but, your kitchen is probably already equipped with a viable strainer that wouldn’t limit you to the size of one can. If you’re someone who is looking to get a workout in while you’re eating your favorite pasta dish, this might be for you. Otherwise, it isn’t likely. This product is a fork that features a crank that you use to twirl your spaghetti. It requires two hands as opposed to one, so it doesn’t seem like it’s making anything simpler for you. You could also check out the automatic one if you’re lazy, which is battery operated and operates with a conveniently placed switch on the side. Sadly, they’re not available with racing stripes. For $19.99 plus shipping and handling, you can sacrifice more counter space for this… interesting device. It serves as a cage of sorts and will hold one cup of grapes, cherry tomatoes, or other small fruits. It features two slots down each side that allow you to run your knife down it to cut them all in half at once. This only holds 10-12 cherry tomatoes, though. You could just as easily use two plates to hold them in place and cut between the plates. You’d be able to get more sliced at once, and wouldn’t have to worry about where you were supposed to put this thing the majority of the time that you weren’t cutting cherry tomatoes. This seems really awesome on the surface. It’s called the GarlicZoom Garlic Chopper by the brand Chef’n (which is represented strongly throughout this ridiculous list). The problem is that Chef’n implores you to buy products based on “smart, easy-to-use kitchen utensils that are built on tasteful design, and new technologies” but… Most kitchen counters offer very little friction, which would impede your ability to roll it around, and the blades can never be sharpened. Once the blades became dull, you would just have to spend another $14.99 because the company doesn’t even offer replacement blades. 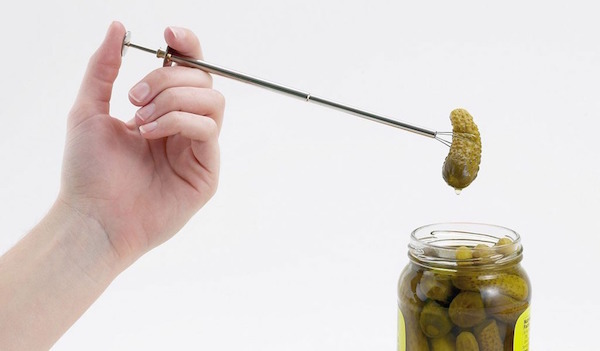 Some pairs of tongs are way too big to fit into a pickle jar, without a doubt. Some people accept these facts of life, and some people make great strides against them for the good of society at large. Maybe that’s what happened here. This is just a tiny pair of tongs specifically for procuring the perfect pickle out of a jar that a standard pair of tongs wouldn’t fit into. Some brands offer this under the name “pickle picker” and some under the name “pickle pincher” and they’re all going to run you around $5-10 with a few premium options costing more because… why not? It just seems like a lot to go through when you probably have a drawer full of perfectly capable forks. For some reason, this device holds up zip-top bags for you. They’re adjustable in height and clamp onto the plastic bags so that you can fill up bags of any size that you might need to. They’re even buy one get one! For just $12.88 plus shipping! There is no real reason that you would need to hold up two bags at once or use this at all, for that matter. You could lay the bag on its side, or place the bag into a bowl, and you wouldn’t have to explain to anyone what that weird green thing was in your kitchen. The company is dedicated to improving your relationship with plastic bags though, as they also sell a weird drying rack for these disposable items. Bananas are the perfect fruit. They come with a durable, compostable, and all natural packaging straight off the tree, and they’re incredibly portable. For some reason, kitchen gadget companies have it out for this humble fruit. Some slicers are “banana-shaped” in their design, and those aren’t practical simply because all bananas are not created equally. Chef’n brand answered with this device, which is just as impractical because it can only be used for bananas. Any tool that doesn’t offer some degree of versatility in the kitchen is an absolute no. The egg molds that sit in a frying pan and allow chefs of all kitchens the same ability to make perfectly round eggs are great! These egg molds are completely different, though. They’re used to shaped boiled eggs. You just press a freshly peeled boiled egg into the mold and submerge in cold water for a little while. If you’ve ever eaten a boiled egg and thought “this was delicious, but I wish that it was shaped like a cute bunny or even a toy car,” I’m not sure where things went wrong for you, but now is your time. On a serious note, this product just doesn’t make any sense despite the huge variety of them available. How could you be sure your eggs would fit? Why would you need a cute boiled egg? Any product that involves the term “cute boiled egg” is in a league of uselessness all its own.